Joerg Eitler looks at a higher safety standard in the oilfield, using progressing cavity downhole pumps including the new ATEX drive head.Newspapers and newscasts report only on the oil price, the funding-quota and the remaining oil resources, never on safety for the humans who are working in the oilfield. Now, due to latest technologies, deeper and more difficult deposits are made accessible. However, people cannot be replaced by technology. Even in the oilfield the service technicians are in a risky area and accidents are caused by uncontrolled gas leakages as well as explosions time and time again. In the case of traditional conveying methods with sucker rods - beam pumps (sucker rod pumps) and PCPs - larger and larger power is transmitted. It is therefore, an increasingly important challenge for the producers of these pumps and systems to make a contribution to the improvement of the safety of these machines. Especially in the range of drive heads of Progressing Cavity Pumps, considerable progress with regard to safety was achieved in the past few years. However, we have to undertstand that extensive new and further development of the whole drive head equipment was necessary, to take an essential step towards maximum safety. - Explosion-protected drive heads - not only motors - corresponding to guideline 94/9/EG - more popular under the designation ATEX. - The Netzsch Drive Heads have the permission for application in zone 1 (area II 2 G EEx c, k, II T3) corresponding to the guideline 94/9/EG. Only permitted materials according to EN 13 463 - 1,5,8 are used. The application of packings is adjusted to the ATEX temperature classification T3. - Automatic torque limiter, in order to exclude an overloading of the braking systems. Each braking system is designed for a maximum torque loading. However, this torque is often exceeded by the using of high-strength sucker rods respectively overdimensioned electric motors. We have to consider that the starting torque (initial breakaway torque) of an electric motor is significantly higher than the normal operating torque. The staff is situated in the immediate vicinity of the drive head particularly during the starting phase of the system. For this reason, it is the absolute priority to exclude an overload of the brake due to an excessive torque. Therefore a special torque limiter was developed which performs automatically at all events and can not be manipulated - irrespective of the ambient temperature. - Improvement of the braking systems in consideration of the application in extreme temperature ranges, eg -40°C in Siberia and more than 50°C in the Middle East and several parts of Africa and South America. - Absolute stability and no risk of unscrewing irrespective of applied motor stands. Not at every well the weight of the motor can be reliably borne by a motor stand. An additional risk for the staff is that the motor stand is also used as an anti-twist protection. An unscrewing of the whole drive head can not certainly be avoided. In the majority of cases additionally applied chains and steel ropes should guarantee an anti-twist protection - however, this is certainly not an optimal solution in respect of the safety. In case of the new ATEX-Drive Head from Netzsch, these auxiliary devices are unnecessary. The stability and the anti-twist protection of the drive head are guaranteed by the new construction. The whole drive head unit onto the well head (Flow T, Blow Out Preventer and Drive Head) is made in a very tight and flanged design. Also the construction height of the drive head equipment could be reduced which would be an additional positive safety aspect during the installation. 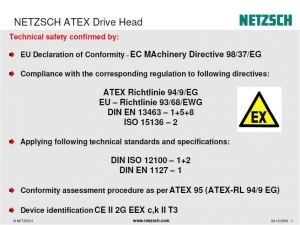 For the new ATEX Drive Head Concept of the company Netzsch Oilfield Products GmbH the most important guidelines for safety are the basis. These drive heads convinced the oilfield operators after the first deliveries and starting ups in Central Europe. On the basis of the ATEX Drive Head Concept with the types L, M and H, all established PCP pumps with a capacity of a few m3 per day up to 500m3 per day and with low pressure up to 300bars can be applied. Beside the safety, an important advantage is also the commercial aspect of the automatic torque limiter in case of the new drive head. Compared with the present systems consequential damages because of overloading, sanding up or a build-up of paraffin are considerably less: only the torque limiter must be released - no breakage of the sucker rods or the rotor. Instead of the application of a work over rigg and the dismounting of the submersible pump out of the well, the drive head can be reactivated at the surface and the real cause can often be eliminated by flushing or a thermal treatment. Furthermore considerable downtimes can be avoided by the fast and simple troubleshooting at the surface. Using the example of the new Netzsch Drive Head Concept it is shown that an optimisation in respect of the safety not always means increasing costs, but can even reduce operating costs.